Manufacturers both large and small continuously strive to optimize their operational processes. Open Systems of Cleveland enables manufacturing companies to achieve this through greater automation and investment-driven, accelerated production cycles. As customer expectations change with the rapid evolution of technology, there is an urgent need for quick product development and innovation to have a competitive advantage throughout the lifecycle of a product. 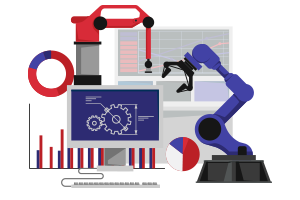 Open Systems of Cleveland helps manufacturers enhance operational flexibility, increasing real-time visibility, improve customer experience, accelerate business digitization, and maximize production uptime. By partnering with us, you can benefit from operations performing at peak efficiency by closing the gap between factory and the enterprise. We will also help enhance collaboration across the network enabling profitability and improved service.